VANCOUVER — With annexation plans looming, many residents in the Green Meadows neighborhood have stepped forward to question the process and urge Vancouver city leaders to allow a vote on the issue. “I’m really upset about this. 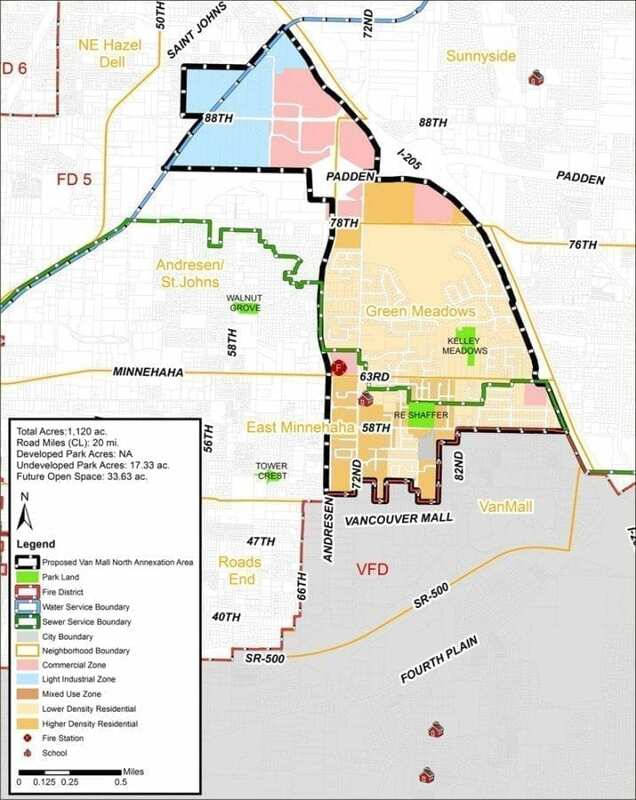 It’s like a big train coming through town and most of us didn’t even know about it,” says Green Meadows resident John Hallinen of the city of Vancouver’s plan to annex 1,270 acres of unincorporated Clark County into the city limits, including the entire Green Meadows Neighborhood and portions of the East Minnehaha, Sunnyside and Andresen/St. Johns neighborhoods. The entire annexation area, known as the Van Mall North Annexation, includes 4,560 people living in 2,195 households. Hallinen has lived in his Green Meadows home at the edge of the Green Meadows Golf Course since 1972. He says he is frustrated by the city’s decision to use the signature method for annexation instead of taking a vote. Hallinen recently reached out to his Green Meadows neighbors and collected nearly 250 signatures from residents who are concerned about the city’s annexation plans. At the heart of the residents’ worries is city leaders’ push to annex without a vote. Under Washington law, city leaders have a variety of methods for annexing portions of the city’s designated urban growth area (UGA) into the city limits. In the Van Mall North case, Vancouver leaders have proposed using an annexation method known as the “60 percent petition” method. This means that the city must have signatures from at least 60 percent of property owners within the annexation area to proceed with the annexation plans. Many property owners, especially those in the Green Meadows neighborhood who have lived in unincorporated Clark County for several decades, say they found out that they’d given their permission for annexation when they signed their utility covenants hooking up to Vancouver’s water and/or sewer systems. Click to view full map. Hallinen says he remembers hooking up to the city’s sewer system in the 1980s and being asked to sign the utility covenant, which basically said he was agreeing to annexation when the time came. Hallinen says the fact that most people sign those types of utility covenants when they’re purchasing their homes, possibly overlooking the fact that they’re signing away their right to vote on annexation, concerns him. 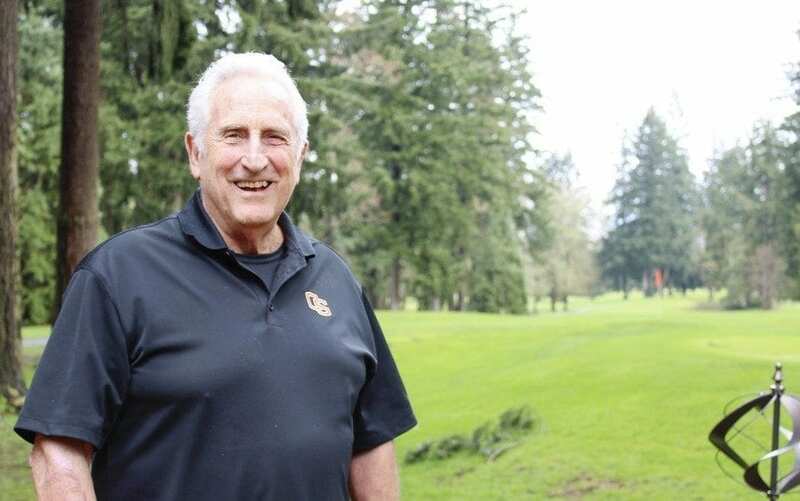 Dave Socolofsky has been Hallinen’s neighbor in the Green Meadows neighborhood since he and his wife, Jean, and their four children moved into a house off the 14th hole of the Green Meadows Golf Course in 1976. Inside the Socolofsky house, a sign warns visitors that this is a house divided: Jean is a University of Oregon Ducks fan, while Dave, a graduate of Oregon State University’s engineering program, is a Beavers’ supporter. But if there’s something the couple can agree on, it is the fact that the Green Meadows neighborhood has served them well over the years. They raised their family in their golf course-adjacent home and now it’s home-base while they travel to golf courses throughout the United States. But Dave Socolofsky says he, like many of his neighbors, worries about the annexation plans. Like Hallinen, he has issues with the city’s plan to use utility covenant signatures instead of taking a vote. He also worries about rezoning that will chop 1,000 square feet off the county’s designated 6,000-square-foot minimum lot size inside the residential areas of the Green Meadows, which could lead to more infill and create a more urban feeling inside the rural, treed neighborhood. Preserving the open space the golf course provides also is important to Socolofsky, and he worries that incorporating into the city limits will degrade the green space he and his long-time neighbors have enjoyed for the past three or four decades. At a recent Vancouver City Council meeting, several Green Meadows neighbors came out to talk with city council members about the Van Mall North Annexation plans. Hallinen voiced his concerns about the push to move away from a vote and use the signatures method for annexation. Others wondered if there might be a way for city leaders to designate the Green Meadows Golf Course as a city park or open space. Go to 27:12 – 33:22 to view testimonies. Go to 41:40 – 50:29 to view council comments. Go to 50:30 – 53:56 to view audience members’ response to the council. City Council members reminded the residents that, because the golf course is privately owned, it would be up to the owner to come to the city with a request for a zone change. City Councilmember Jack Burkman suggested that perhaps the golf course neighbors could come together as a group and try to purchase the golf course. Burkman added that, while he empathized with the Green Meadows residents’ concerns, he didn’t want to see the issue of the golf course derail the entire annexation discussion. Burkman said the city could not tell a property owner that they couldn’t use their property for its designated zoning uses. City Councilmember Bill Turlay disagreed. He said he wanted to find a way for the city leaders to work with the neighbors who may soon be annexed into the city limits. The Feb. 13 meeting was step one in the annexation process. 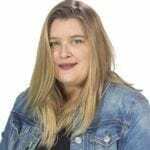 The Vancouver City Council likely will hold two public hearings in March or April on the issue before approving or rejecting the annexation plans. To read more about the Van Mall North Annexation, visit the city’s information page. To keep up to date with the city council’s upcoming agenda items, visit www.cityofvancouver.us and click on the “Inside City Hall” then find the “Agendas and Minutes” link under the Mayor and City Council header.